Despite the proliferation of Subway & Quizno’s franchises across Louisiana, the sloppy roast beef poboy is not (yet) extinct. Thanks to independent sandwich shops, a diner can still return to work after lunch wearing shirt-front gravy splatters and needing to floss. Still, rising prices and energy costs have driven some sandwich-makers to cut corners: occasionally, thin, deli-sliced roast beef washed in gravy replaces thicker-cut, slow-cooked beef, and insipid, squishy bread (rather than crisp, local French bread) makes an appearance more often than I’d like. At Thibodaux’s Frostop (305 North Canal Boulevard, 985.447.0098), the beef is certainly not thinly sliced. 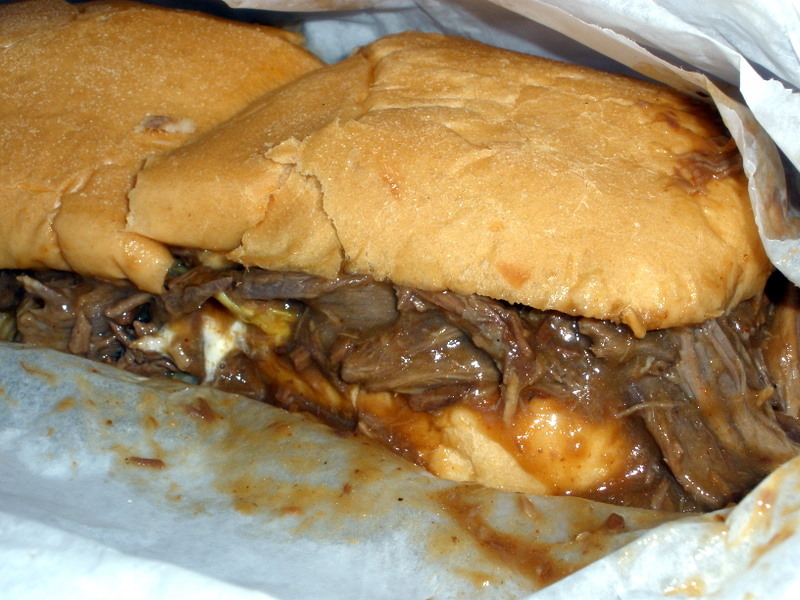 Rather, a Frostop roast beef poboy still overflows with ragged beef shreds; the bread barely contains a flood of meat and gravy. Tastewise, the Frostop sandwich is fine–not the best in the state, not uber-memorable, but a solid example of the genre. The bread, though a bit on the soft side, stands up to the gravy-delivery task without dissolving into mush. Beyond the roast beef sandwich, the Thibodaux Frostop has something unattainable by a Quizno’s or Subway: it has personality. A friendly, hustling cadre of ladies man the cash registers and open kitchen, wearing neon Frostop t-shirts. Beyond the front counter, the L-shaped dining room is the province of the Wildman: a jester-hatted, Saints-fan maitre d’, busboy, and server extraordinare, all rolled into one. He darts around the space, refilling drinks, doling out packets of salt and pepper, delivering orders to tables, taking away trash–all while conveying a sense of hospitality, efficiency, and order. In an age when surliness and indifference are too often the norm at fast food and quick-service establishments, a guy like Wildman is a breath of fresh air. The staff at this place is truly the best. It truly makes a difference in the dining experience. Yes, the “vibe” is very different from a rushed, indfferent fast food experience. 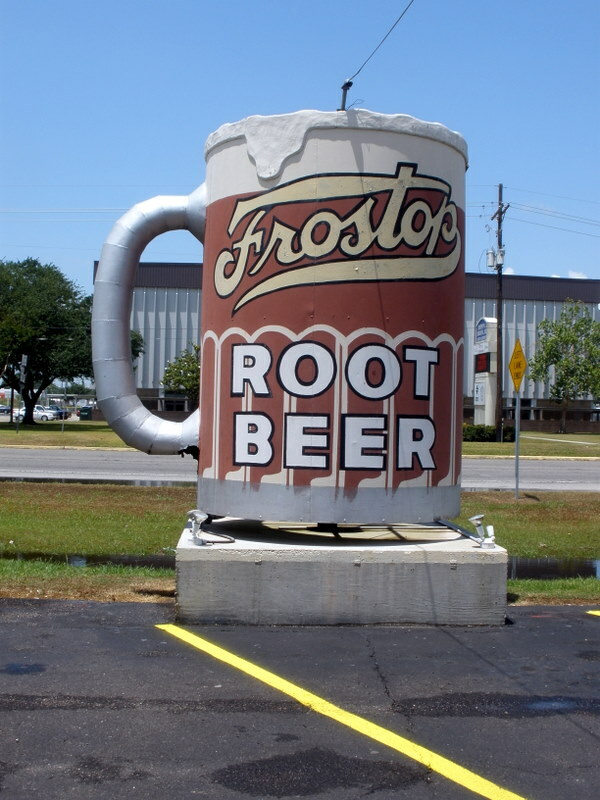 I wish they did po-boys in BR Frostop. We just get burgers. Hmm, I know the BR Frostop USED to do credible roast beef poboys, in the early to mid 90s. The place even had decent poboy bread, back then. Sammys!!!!!! best roast beef poboy in town. It’s hard not to eat crawfish at Sammy’s though. They have a good muffaletta too.